Arjun: The Warrior Prince makes an adventure out of the scared text by framing the tale within an embedded narrative that sees a young prince named Kunti hear the saga told to him like a bedtime story by one of his nurses. The woman tells in detail the rise of Arjun and the many tasks he faced. Arjun makes an awkward leap from Sanskrit epic to screen as it delivers a choppy and often incoherent series of scenes that build up the mighty hero in young Kunti’s mind. Arjun: The Warrior Prince plays like an endless series of scenes designed to trumpet the hero’s unsullied aura. It’s one snippet of beatification after another. The film is a notable co-production between Walt Disney Pictures and India’s UTV Pictures, which is owned by Disney, yet it can’t shake the hand of Mickey Mouse that has brought this traditional story to life. The themes of Arjun are hammered in with a squeaky rubber mallet and the film feels so condensed that the philosophy of the tale takes a noticeable backseat to the rollercoaster ride of Saturday morning cartoons. The abbreviated flow of Arjun seems especially weird when the film offers a random intermission in the midst of its 95-minute running time. The break lasts for approximately thirty seconds and cuts to black as if there was no other serviceable device to connect the threads of the plot. It’s a fast-paced adventured that is bound to please kids with short attention spans, but this Disneyfied tale doesn’t play like the far cry from the studio’s earlier bits of cultural appropriation with films like Aladdin and Peter Pan. Arjun also suffers from the rampant sexism of early Disney works, which might have been inevitable while making a male-centered tale, as the film is wholly void of substantial female characters. This one seems designed strictly for the boys in the room. Has Mulan already been forgotten? There is, admittedly, much to admire in this epic production. 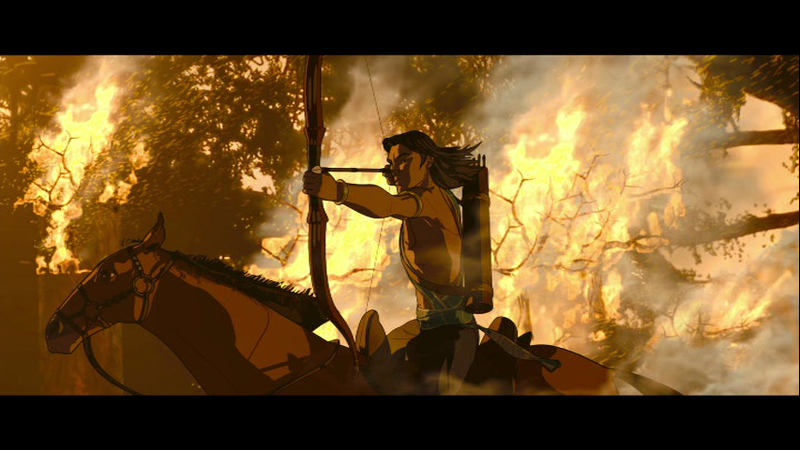 The themes and characters of Arjun might provide echoes of the old Disney, but the 2D animation looks as good as the studio's classic productions. This tale wouldn’t have been appropriate for a full 3D adventure, so the classic style complements the legend nicely. The layered flames of fire that flicker throughout Arjun are especially striking. Any credibility that Arjun gains throughout the adventure, though, flies out the window with a ludicrous plot twist that is sure to have the audience howling. The final act of Arjun is unintentional comedy at its best. (The surprise brought a roar from the crowd at Sunday’s OIAF screening, and chuckles failed to cease until the credits rolled.) The final reversal of Arjun: The Warrior Prince leaves one noting what a clumsy missed opportunity the film is. Arjun: The Warrior Prince conveys the lessons of the legend only loosely and the film never fully delivers on providing entertainment for mature audiences with its sugary simplication. Arjun is a noble effort, but it might as well be another tale in which a hero finds nobility by saving helpless damsels and conquering evil snake charmers.